The Navy's Ranks Are Called "Rates"
The Navy doesn't have "ranks," instead it has "rates," which is a combination of the person's rating (job) and their pay grade. Only the Army, Air Force, and Marines actually have "ranks," to denote personnel in various pay grades. 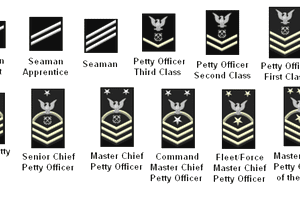 For example, a Senior Airman in the Air Force has the "rank" of Senior Airman and is in the pay grade of E-4. You address him/her as "Senior Airman," regardless of what his/her job actually is. For example, the "rate" of an E-6 in the Navy (i.e., what you call him/her) depends on the person's job. A person with the rating of Sonar Technician (SG) in the Navy, in the pay grade of E-6, would be an "SG1," or Sonar Technician First Class Petty Officer. An E-5 with the rating of Mess Specialist (MS), would have the rate of MS2, or Mess Specialist Second Class Petty Officer. There is a difference between the services and how they acknowledge each other on a day-to-day basis. Also within the Navy, the ranks of the enlisted personnel have the following requirements and timeline to be eligible for promotion to the next higher rank. The below chart shows the minimum requirements for Navy enlisted promotions in the pay grades of E-2 through E-4. Selected ratings must complete applicable performance test before taking the Navy Service-Wide Advancement Exams. Enlisted Performance Evaluation Used by Commanding Officer when giving promotion approval. Counts as performance factor in Advancement Final Multiple for all E-4 through E-7 candidates. Obligated Service Requirements There is no single set of obligated amount of service required to take Navy-wide advancement exams or to accept advancement to pay grade E-2 to E-6. Nonresident Career Course and RTM None Required for all E-3 and Petty Officer advancements unless waived due to completion of Navy School. Courses need only be completed once. Recommended by Commanding Officer All Navy Advancements Require the Commanding Officer's recommendation for advancement on current evaluation. The below chart shows the minimum requirements for Navy enlisted promotions in the pay grades of E-5 through E-9. Performance Test Selected ratings must complete applicable performance test before taking the Navy Service-Wide Advancement Exams. Enlisted Performance Evaluation Counts as performance factor in Advancement Final Multiple for all E-4 through E-7 candidates. Considered by Promotion Board when making promotion decisions. Obligated Service Requirements There is no single set of obligated amount of service required to take Navy-wide advancement exams or to accept advancement to pay grade E-2 to E-6. Must remain on active duty a minimum of two years to retire at the higher pay grade. Examinations Navy-Wide Advancement Exams are required for all Petty Officer Pay Grades Promotion to E-7 requires Navy-Wide Advancement Exam and selection by the Navy-Wide CPO Selection Board. Promotion to E-8 and E-9 is accomplished by Navy-Wide Promotion Selection Board, only. Nonresident Career Course and RTM Required for all E-3 and Petty Officer advancements unless waived due to completion of Navy School. Courses need only be completed once. Nonresident Career Courses and recommended readings (See NAVEDTRA 10052). What Is a Third Class Swimmer in the Navy?